Fortress Watchman is a common Strength creature card. It is part of the Core Set. In addition to the card's availability in the Core Set, three copies are included in the Dagoth's Might theme deck. "There is always a blood price." "By Yashnag's axe, I'll defeat them all!" "I'll cut you to ribbons!" "You'll die where you stand." 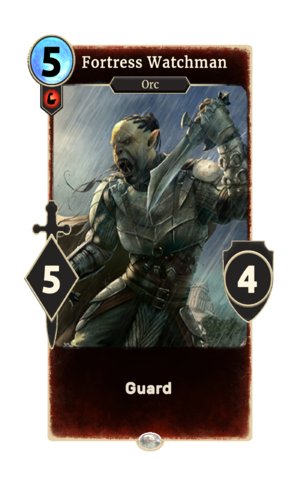 The card's opening audio, "There is always a blood price", refers to the Orcish tradition of bleeding criminals as punishment. This page was last modified on 13 February 2019, at 23:49.